I recently waged a war against the New York Times. 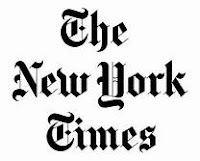 I have been reading the New York Times every day since I went off to college approximately 200 years ago. For decades, the paper has been delivered to my doorstep. Every morning I start my day with a double shot of espresso and a review of the headlines. I read no more than one story about Donald Trump so that I can refrain from throwing crockery against the wall. I culminate with the crossword puzzle which I fill out with a fountain pen filled with my favorite orange ink. All of this has been going on for decades like clockwork. Until 3 weeks ago when it stopped. Sometimes I got the paper late, sometimes times it didn't come at all. I called customer support endless times. Nothing changed. They refused to connect me to the company that actually delivers the paper. Since the weekend paper came just fine, I cancelled my weekday paper. I tried reading the paper on line and printing out the crossword. One day the Saturday paper failed to arrive and I called customer service again. This time, I was connected to the delivery company. My contact there, Rosa, fixed everything and actually followed up to make sure I got my weekend paper. I decided to go crazy and restart weekday delivery. Sometimes you just need a human. And virtual is not good enough.